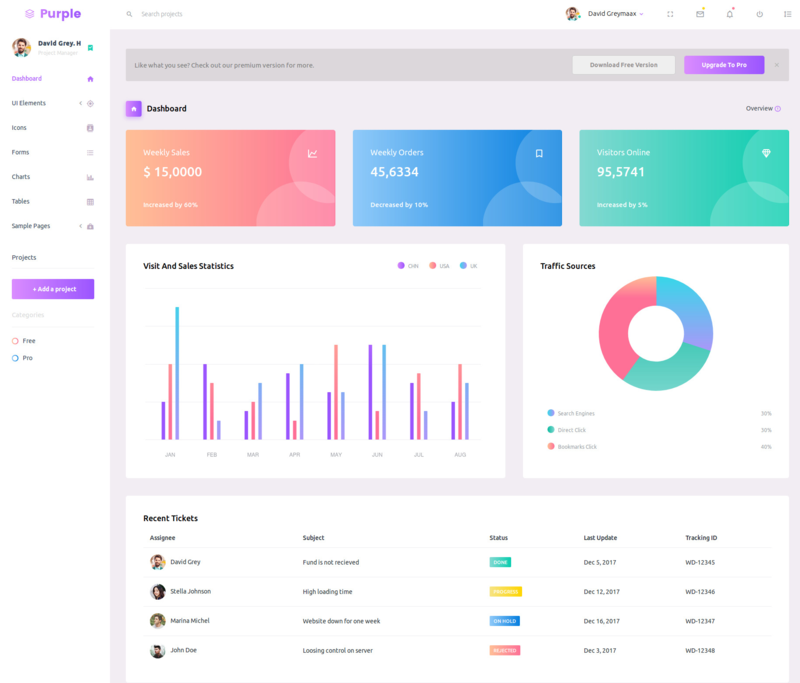 (Updated on January 18 2019) With the rise of Bootstrap framework as the most popular front-end component library, eye-catching Bootstrap admin templates have become the norm. Bootstrap makes it easy to create responsive, highly customizable, attractive admin templates. There are many available admin templates that provide functionalities essential for your back-end application. 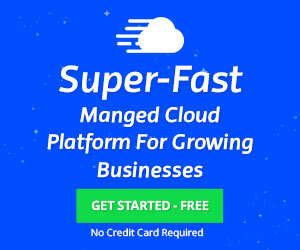 There are free and premium admin template available on the internet, with some free admin templates as good as the premium ones. Admin templates undoubtedly save a lot of time and money, possibly thousands of dollars, when developing the back-end of a web application. You don’t need to start coding from scratch, and you wouldn’t need to worry if you are not a good designer and you can’t hire a designer. Most of the work for the user interface for your web application has been done. All you need to do is to select a template that is most suitable for your design, download it and then incorporate it into your project. We have shortlisted few beautifully designed Bootstrap 4 admin templates that are completely free! The Equinox Bootstrap admin template boasts a fascinating collection of useful elements and excellent features. With 10+ layouts to choose from, this template will enable you to easily build and customize websites. Built using the latest version of Bootstrap, SASS, HTML5, jQuery, and CSS; Equinox boasts several ready-to-use widgets. Other note-worthy points include high responsiveness and cross-browser compatibility of this template. 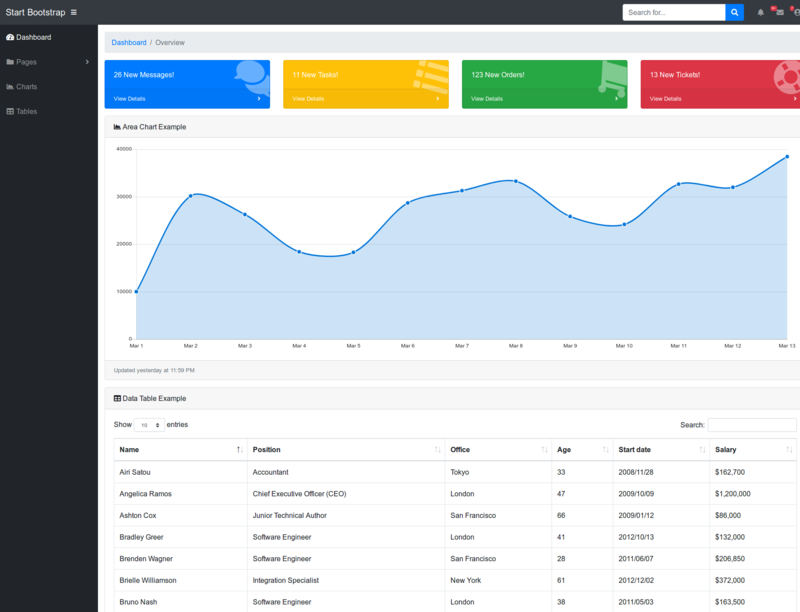 More than 15 UI elements are also available with this free Bootstrap admin template. If you are looking for a clean, minimalistic admin template that is easy on the eyes, look no further! 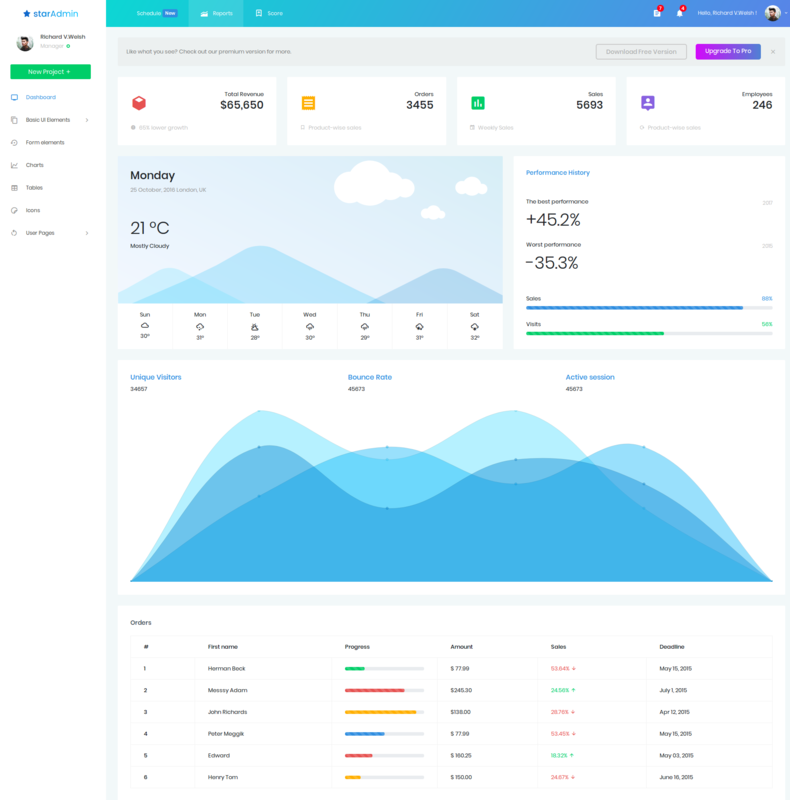 This highly responsive Bootstrap admin template was built with the Bootstrap framework, CSS, jQuery, HTML5, and SASS. The clean, well-commented code of HiliteUI template makes working with a walk in the park! The user-friendly design, cross-browser compatibility, and other stunning features of HiliteUI will surely impress you to the core. More than 10 handy UI elements are included with this template. The most eye-catching UI elements available with HiliteUI are the Buttons, Badges, Dropdowns, Accordions, Tabs, and Tooltips. Want a classy and distinct design? Look no further! 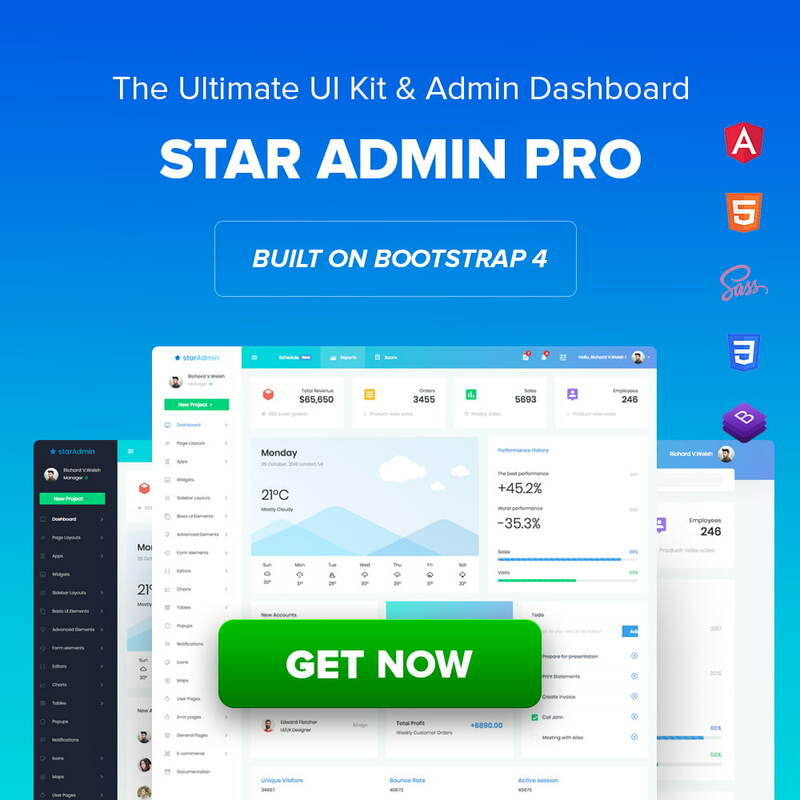 Star Admin is a free Bootstrap 4 admin template from BootstrapDash. Fully responsive and highly customizable, it has a very elegant, clean and flat design. With the use of very soft colors, the design is a treat to the eyes. From buttons to forms, tables, charts, icons, sample pages etc; it features every component required for a good project. If you are looking into creating admin panels, e-commerce systems, project management systems etc, StarAdmin may just be the best fit for you. Star admin is an easily customizable template with clean and well-commented code. Purple is one of the few Admin templates to achieve the impossible– blend attractive color gradients without compromising on legibility or usability. If you are looking for colorful admin templates to bedazzle the user, Purple should be your obvious choice. A very well designed interface implemented through a very well written code, Purple has a very modern design with many neatly designed components. The template comes with all basic components needed in an admin template. It’s got a powerful admin dashboard, basic UI elements including various types of buttons and template typography, form elements and Font Awesome icons. Powerful data representation and organization are achieved using Chart.js and responsive Bootstrap tables. There are 5 sample HTML templates including a blank page, login page, register, 404 and 500 error pages. 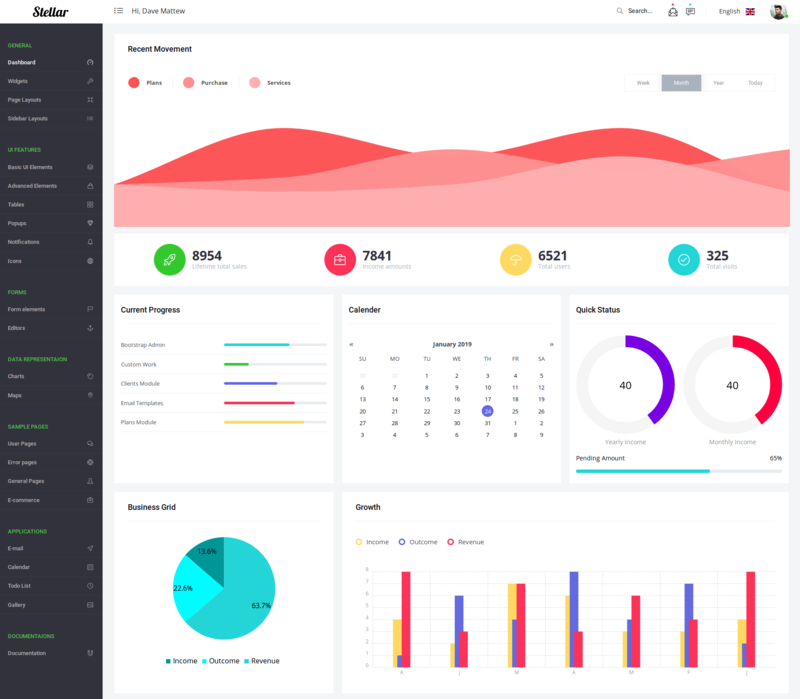 Stellar admin dashboard is a free dashboard based on Bootstrap 4. Stellar is a multipurpose admin dashboard that can be used for any type of web application. It can be used to create extremely professional admin panels for the backend of any website or web application. 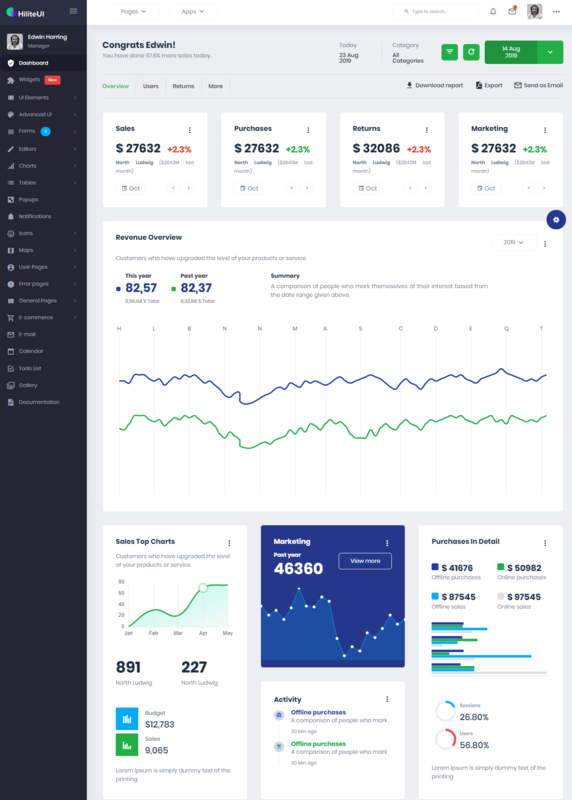 The dashboard featured in Stellar gives you insights of all the data of your website using its various data representation and data visualization techniques. Stellar is an amazing dashboard with neatly designed components that are realized by well-structured, systematically organized and well-commented code. This makes it very easy to work with the template and customize to make it look the way you want. Stellar admin dashboard includes everything that you can ask for in a free admin dashboard. It has got a general purpose admin dashboard, widgets, basic UI elements, tables, icons, form elements, charts, and sample pages. 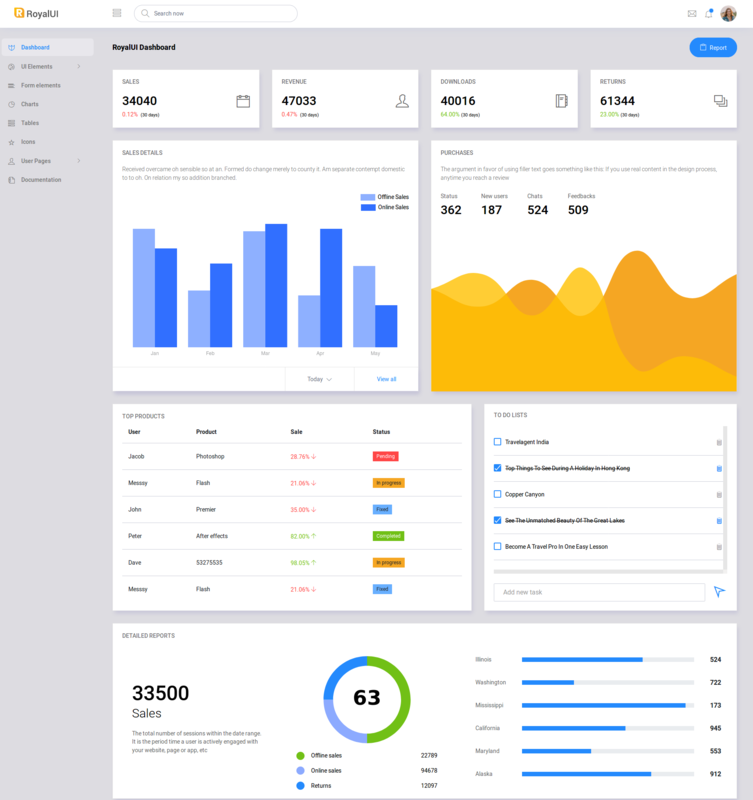 If you are building a heavy-use software solution where your users would be poring through the dashboard for hours on end, Majestic bootstrap template would be a safe bet. Built with CSS, HTML5, jQuery, SASS, and Bootstrap framework; this template will give you access to plenty of UI elements and other tools that will help you to build a flawless web app. The well-commented clean code is easy to comprehend so you will able to figure out how to edit the template to your convenience, even if you are new to the world of web design. The simple design, easy to customizability, and other features of Majestic Admin will surely impress you. 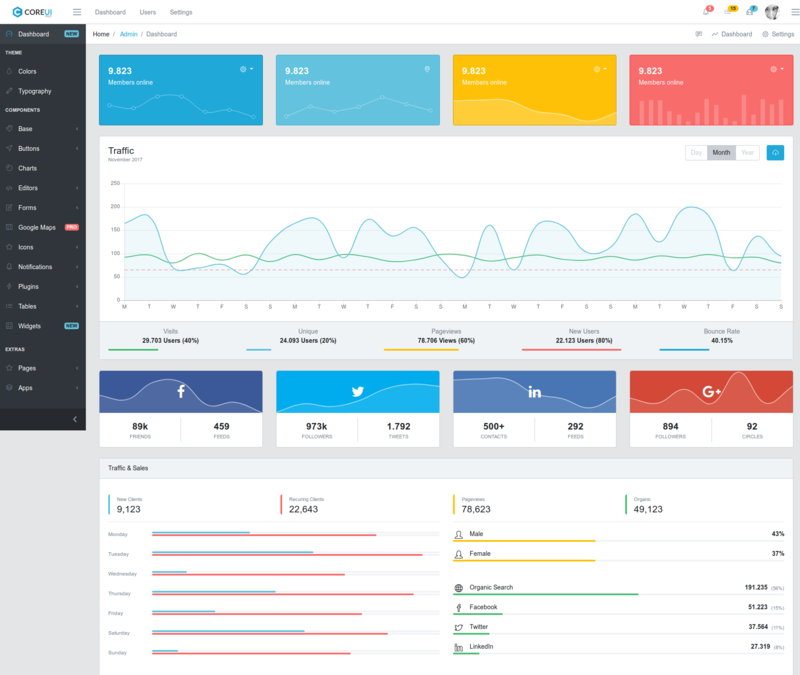 RoyalUI is easily one of the best free Admin Dashboard template on our list. Each UI elements are packaged inside distinct cards for easy usability. From the font to each icon, everything in this template is designed to impress users. Special emphasis has gone into selection of colors for faster distinguishability. 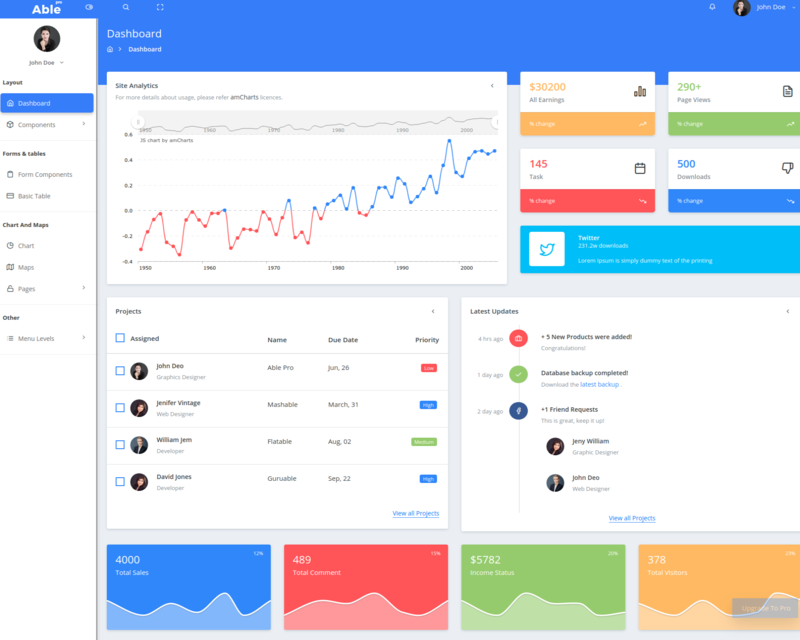 Responsive by design, this Bootstrap 4 Admin template is the best choice for your new project. The first one in the list is an admin template that is completely on the Material Design. Although not built on bootstrap framework, Material admin template is so well designed, that it is worth mentioning the template in this list. The template is built using the design framework by Google, Material Components for the Web. 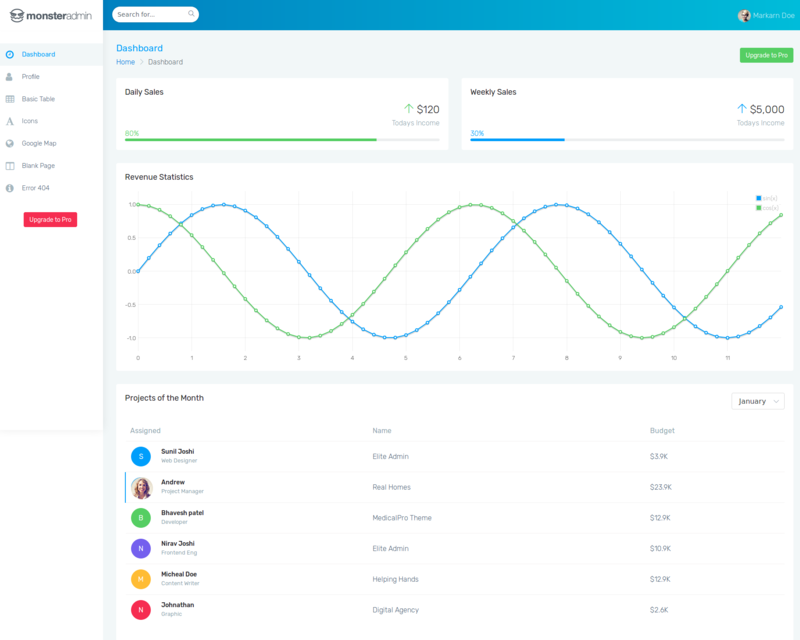 Material admin template is a completely responsive admin template that gives the best user experience on all the devices. The components are beautifully designed and very elegant with light backgrounds and contrasting and eye-catching colors for the components. The interface looks neat with all the components neatly organized. The features of the template include a dashboard, form elements, UI elements, tables, charts, and different sample pages. Able Pro Lite is an attractive and interactive admin template based on Bootstrap 4. The template has a very beautiful design with amazingly designed widgets and other UI components. The template has Google’s Material design. Its big typography and good use of white space make the template user-friendly. The use of bright colors makes the template fun without losing its professional look. The features of the template include a stunning dashboard, a good collection of charts and maps, form elements, tables, and pre-built pages that comprises of four authentication pages, lock screen, a sample page, and a search result. It also includes a multi-level menu up to 4 levels. 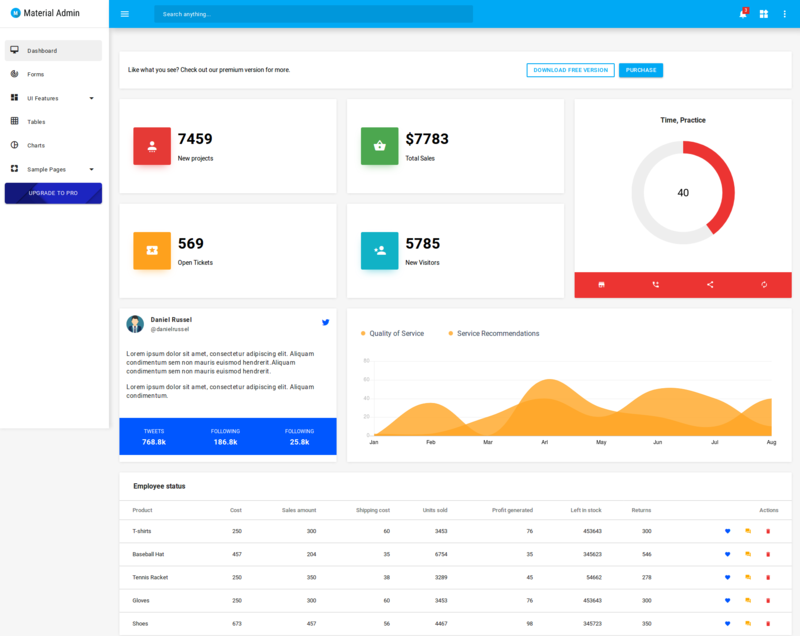 SB Admin is a free Bootstrap 4 admin template from Start Bootstrap. The template comes with 3 custom panel colors – red, yellow and green. It is responsive and comes with better features including the basic Bootstrap components, charts, widgets etc. Start Bootstrap provides support for issues through their help page. Also, there is a helpful discussion in the comment section on the website. Modular Admin is a neat, simple and elegant admin template built on top of Bootstrap 4. It is fully responsive and can be easily customized. It comes in 6 skin colors and you can choose the header, footer, and sidebar to fixed or static with respect to the dashboard. Browser support for the admin template includes Chrome, IE 10+, iOS Safari 7+, and last two versions of Firefox. Well written description of how to use the template has been given in the documentation to help you get started with your project without much delay. 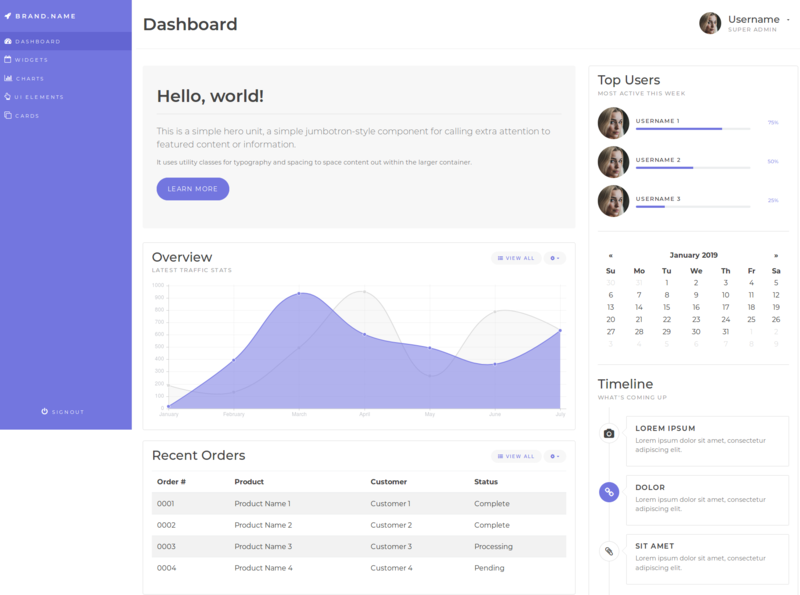 Pike admin is a fast lightweight admin template based on Bootstrap 4. Pike is a free admin template and has everything you can ask for in a free template. The template has charts based on Chart.js. Responsive tables based on Bootstrap and extended using Data Tables plugins, you help you organize your data. There are a lot of components included in the User Interface including alerts, buttons, cards, carousel, collapse, icons, modals, tooltips, and popovers. 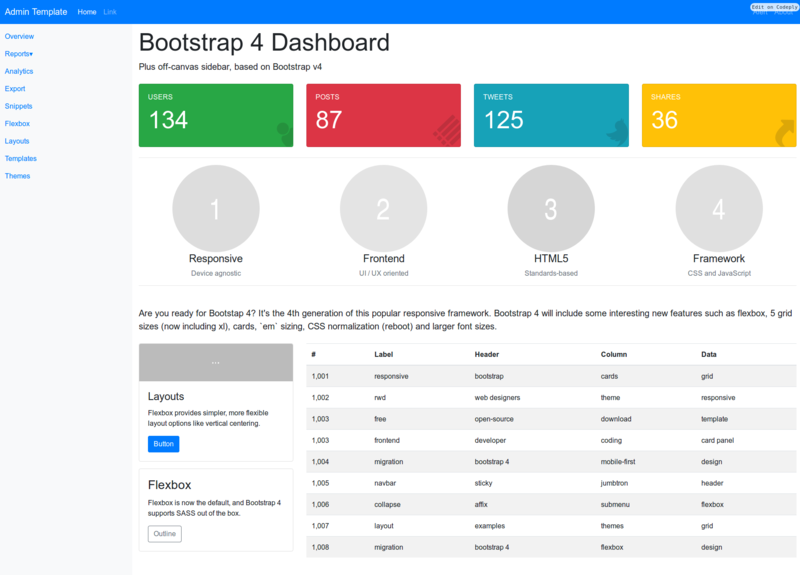 Many third-party plugins have been included in the template to extend the functionalities of Bootstrap 4 and make it a more powerful admin template. The template is compatible with most of the modern browsers. Vali Admin is free admin template built with SASS, PUG.js, and the latest version of Bootstrap. The template has a minimalist design with more emphasis on the functionalities. It has got an amazing admin dashboard and powerful Bootstrap components. These components are also extended using many third-party plugins. Apart from a great collection of basic UI elements like charts, forms, tables, Bootstrap elements, Icons, etc.The template has very well designed page templates which includes a blank page, log in, lock-screen, user page, invoice page, calendar, a mailbox, and an error page. 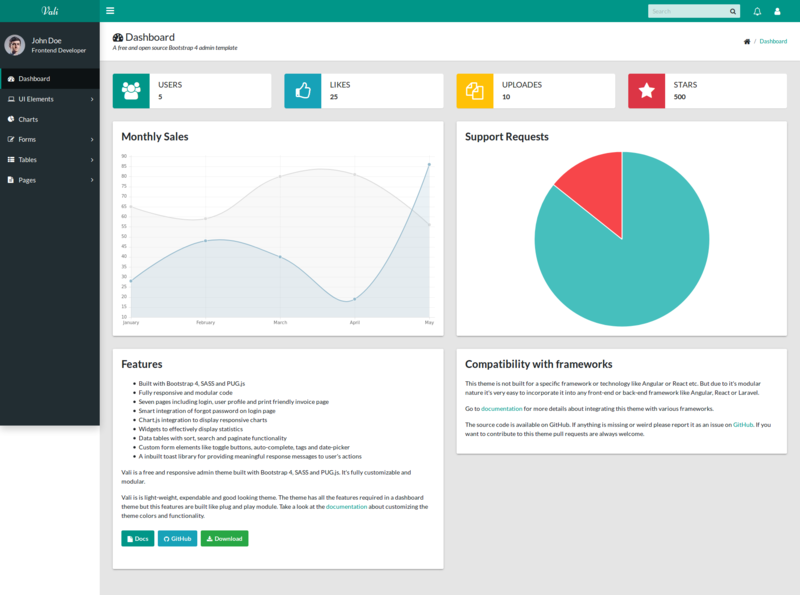 Bootstrap 4 Admin Dashboard is a responsive admin template designed at Codeply. It has the basic Bootstrap components and easily customizable. 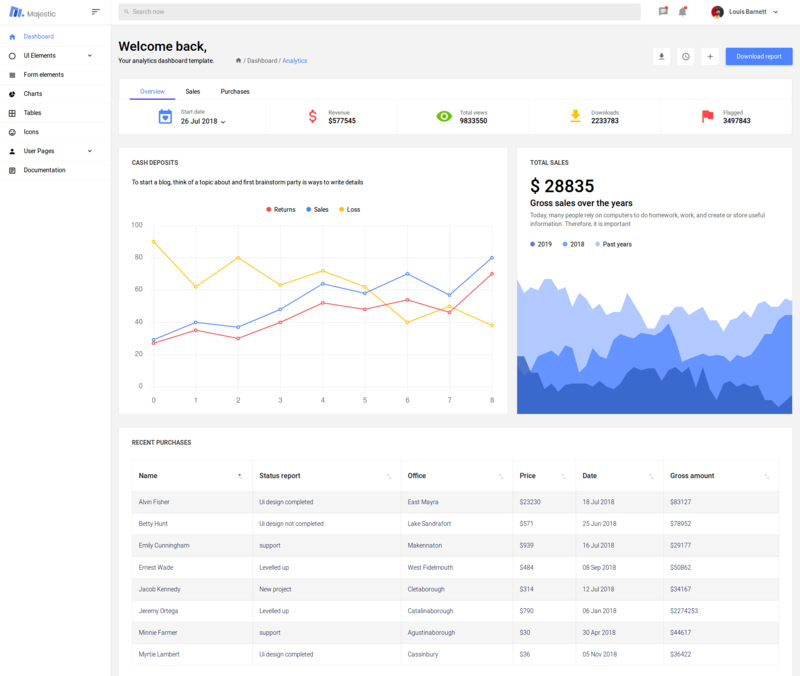 Monster Admin Lite is a free admin template built with Bootstrap 4 and designed with Google’s material design. The template has a light theme with the minimal use of colors and good use of white space. The template has been customized to override the default bootstrap styles. Monster Admin Lite is responsive admin template that looks good on devices of any screen size thus improving the usability of the admin template. The features of the template include the dashboard, a profile page, basic table, icons using Font Awesome, Google map, a blank page and an error page. 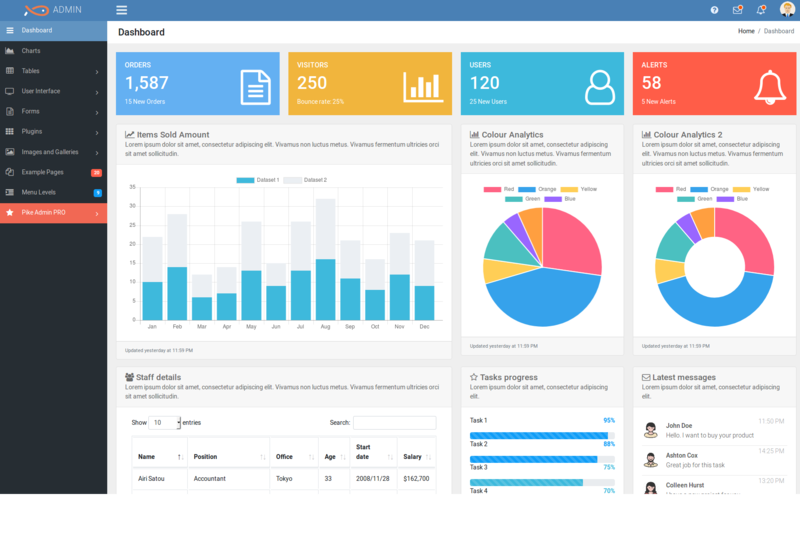 Bootstrap 4 Admin Dashboard Template by Medialoot is a free responsive admin template based on Bootstrap 4. The template comes in 5 different theme colors and has bold typography and large-sized elements that stand out. The template has many features like widgets, charts, buttons, forms, tables, cards, icons and 2 pre-built pages.